Lets keep it striclty Hawks! The Atlanta Hawks released their 2015 Summer League roster Monday, which includes 2014 second-round draft pick Edy Tavares and 2013 second round draft acquisition Mike Muscala. Lamar Patterson, who Atlanta received in a trade on draft night last year, rounds out the list of players with whom the Hawks have rights. Those three are joined by 12 undrafted roster invites, including Stephen Holt, who was on the team last summer and impressed the Hawks' staff with his dazzling three-point shooting during last summer's elite eight run. Al Horford and Paul Millsap, who comprised Atlanta's starting frontcourt in 2014-15, both have younger brothers playing for the Hawks this summer. Jon Horford, who played at Michigan before transferring to his brother's alma mater Florida to finish his college career, joins Abraham Millsap, one of four Millsap brothers. 2015 Pac 12 Tournament MVP Brandon Ashley gives Atlanta a stretch 4, and Tomas Bellas gives the Hawks their lone "true" point guard. Bellas and Tavares were teammates with Gran Canaria. Assistant Coach Kenny Atkinson will be the team's head coach in Las Vegas. Atkinson also recently accepted the Dominican National team's head coaching position and led the International. Josh Davis, DeAndre Kane, Trey McKinney-Jones, Mike Moser, Terran Petteway, Greg Smith and Elston Turnerround out the roster. See the full team below. Atlanta Hawks forward Austin Daye scored 52 points in his Drew League debut Sunday. The Drew League, widely-regarded as the best "pro-am" league in the country, takes place in Los Angeles every summer. Some NBA players play to stay in shape and get in some game action during the offseason. Players in recent years have included Paul George, Brandon Jennings and Kevin Durant. Daye's 52 points came on just 25 shots and included 8 made threes. "I was just trying to be aggressive...put pressure on the defense," he said in a postgame interview. Daye said he averages 35 points per game in the Drew League, but his Sunday output was a season-high for the entireleague. "My friends, we all have a group chat. We had a bet going that I would get 50," he said. Daye has played in the Drew League each of the past 5 years, including going head-to-head against Durant in 2013 and earning Player of the Week honors in 2012. He noted that he played alongside Jennings and Jordan Hamiltonlast summer, so he didn't get as many shots. "My thing is being able to work on my game and take shots that I'll take in games." It would be so nice if Daye actually blossomed into something good and gave us quality in his minutes. If only, he just seems so disengaged. He's a stretch four that can't shoot. If Bud didn't coach him in SA, he wouldn't even be here. 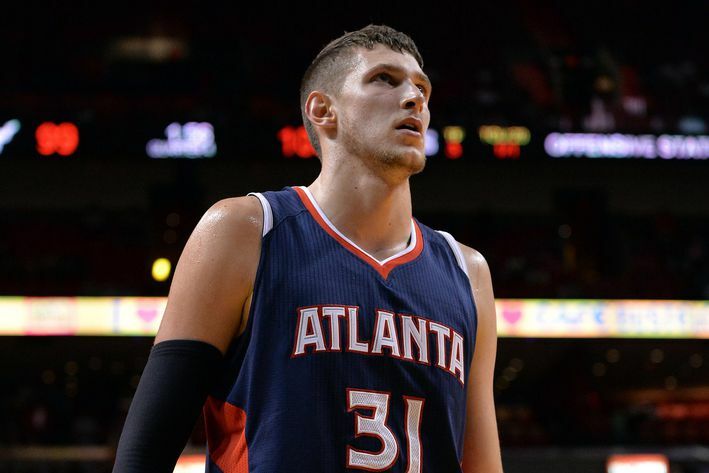 "Muscala has showed continued improvement in his two seasons with the Hawks after being a second-round pick. He appeared in 40 games last season and averaged 4.9 points and 3.0 rebounds in 12.6 minutes. He has improved his 3-point shooting and made a huge long-range basket in the playoff series against the Wizards." The 6-11 Muscala, drafted No. 44 from Bucknell in 2013, played in 20 games as a rookie and averaged 3.8 points and 2.6 rebounds in 10.8 minutes. Making twice as many appearances last season on Atlanta's Eastern Conference champions. Edy Tavares: He's proof that there are still giants waiting to be discovered. Despite being 7-3, Tavares somehow managed to avoid picking up a basketball until six years ago. He's essentially a great big ball of clay right now, but apparently Hawks coach Mike Budenholzer is ready to mold him, as Tavares recently signed a multiyear contract. Brandon Ashley: Like so many before him, Ashley left school early just to go undrafted. Ashley was a McDonald's All-American out of high school, but he regularly took a backseat in his three seasons at Arizona. If he can show legitimate NBA 3-point range in this setting, he could play himself into a training camp invite somewhere. Millsap/Horford: Millsap and Horford ... at summer league? That's right. Paul and Al won't be playing, but their brothers will be (even though Abraham Millsap's college career consists of 30 whole minutes at Middle Tennessee State). Al Horford's brother, Jon, has a more legitimate claim to a roster spot, but nepotism is thinly veiled in Vegas. I'm thinking we will get a Schroeder type rise out of this guy. I liked him when we drafted him. Put me down for Moose. Rooting like **** for him. If he becomes a dependable 3pt. shooter we won't miss Pero at all. I'd rather he becomes more dependable in the paint. Pero couldn't hit a layup to save his life, and he had no post moves whatsoever. Pero was also the worst rebounder I have ever seen. Other than hitting 3's the first few games against Indiana, he didn't do anything. The game will be live online only tonight, but will be aired Sat.morning on NBA TV. Watching a little bit of it Brandon Ashely isn't bad, and Moose is just continuing on love it. Heard Moose looks good and Edy's had some nice blocks and rebounds. (really the only two you really care about) But otherwise they're getting destroyed. Probably played MIllsap's brother a little too much. So far Edy, Moose, and the Brandon Ashely kid are all I care about he's gotten some nice looks I'm watching online(not saying where), but I've watched. Wonder if giving Lil Sap a spot on the Summer team was part of the deal of getting Paul to re-sign. Heard he looked just terrible out there. Agreed I think if he puts some effort on the defensive end then he will definitely be on his way. I'm just glad he's getting playing time. The Hawks took a loss in their summer league opener to the Denver Nuggets and 7th overall pick Emmanuel Mudiay. The Atlanta Hawks opened up the Las Vegas Summer League with a loss to the Denver Nuggets, led by Emmanuel Mudiay, by a final score of 86-71 on Friday night. Mike Muscala started off the first five minutes of the game 2-for-2 from the field with six points and three rebounds for the Hawks, continuing his trend of good play from the postseason. Terran Petteway also came out strong, with five points of his own, as well as a steal in the first five minutes. Edy Tavares, the 7-3 prospect didn't come out as strong as the Hawks would have hoped, going 0-for-2 from the field with two rebounds. Emmanuel Mudiay also showed us why he was the 7th overall pick in the draft, showing great speed and athleticism, scoring 4 points on 2-of-3 shooting, with two rebounds and an assist. After what was a close first quarter, the Nuggets stretched out a 24-15 lead at the end of the quarter. The Hawks narrowed the gap to 43-36 to finish off the half. Lamar Patterson led the Hawks in scoring for the half with nine points on 3-of-4 shooting from the field. Patterson also contributed three points and three assists. Mike Muscala slowed down from his first half performance, shooting 3-of-9 from the field. Edy Tavares got his first two points of the game on an alley-oop from Lamar Patterson in the final seconds of the half. Emmanuel Mudiay and Jamaal Franklin had eight points apiece, leading the Nuggets in the first half. The third quarter belonged to the Nuggets. Mudiay was clearly the best perimeter player in the quarter, making Hawks defenders look very inferior. Lamar Patterson continued to lead the Hawks on the offensive end, in a quarter where the Hawks were outscored 23-15. Nikola Jokic made the Nuggets first 3-pointer of the game to close out the quarter with the Nuggets holding a 66-51 lead. The fourth quarter was much of the same for the Nuggets, who were just too much for the summer league Hawks, with a final score of 86-71. Rookie Emmanuel Mudiay had 11 points, five rebounds, and four assists in his debut. Gary Harris led the Nuggets with 15 points, and added four rebounds, as well as three assists. Lamar Patterson led Hawks scorers with 16. Brandon Ashley contributed 15 points and five rebounds. Mike Muscala had eight points, and led the Hawks with six rebounds. Edy Tavares finished with just four points and five rebounds. The Hawks will look to bounce back on Sunday, when they face the Golden State Warriors at 8:30 p.m. EST. Shoulda drafted Bobby Portis. Scored 23, on 9-14, 7 rebounds, and hit a couple 3's. Played def on Townes at center or can play PF. Is active on the boards and on defense. Good passer, high b-ball IQ. Has post moves, can shoot 3's and take big men off the dribble. Showing why the do it all big man won the SEC player of the yr in a conference with Kentucky. It's one game lol. Portis could be really good, but let's not base his entire future on one summer league game. 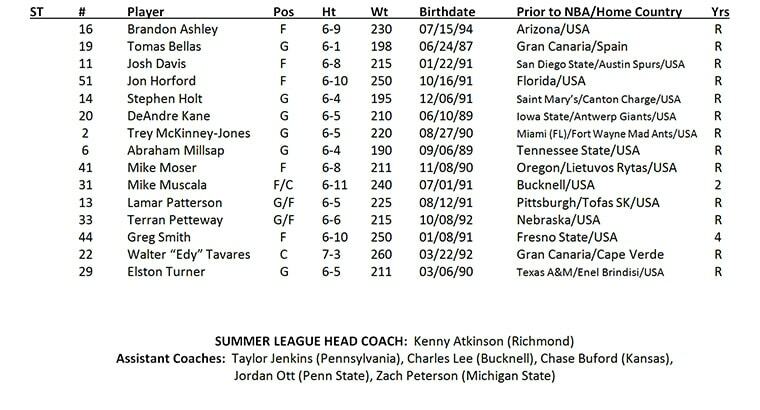 Actually can't base anyone's future off Summer League they look okay is all you can pretty much say. Friend was telling me about the Mario guy that Orlando picked up, but problem is these guys may not be that good at all. All I care about for Edy at this point is Rebounds and defense at the rim. He played only 17 minutes with (I'm sure Portis played more) 5 rebounds and 2 blocks. Although he has two seasons in the NBA under his belt, Atlanta Hawks forwardMike Muscala still feels that it's valuable for him to get as much playing experience as possible. Thus, Muscala finds himself in Las Vegas this summer, where the 24-year-old is learning what it's like to be one of the primary players on the court with the team's summer league squad. "This is more than simply playing against first- and second-year players and hordes of others looking for training-camp invitations or roster spots internationally or in the NBA Development League. Muscala will work on being the first option of an offensive possession — something that has not been the case during his brief professional career. 'I think he wants to improve as a player and we, as a staff, and him decided this is another tool to get better,' said Hawks assistant coach Kenny Atkinson, who is leading the Hawks’ entry. 'The good thing about this is he can be the focal point a little. … What’s it like to be the first option on a team? What’s it like to lead a team? He is kind of leading this group. It’s not the regular season, but I think it’s a great experience for him all around.'"